Hidden in the hills of mid-Northern Vancouver Island is an oasis of civility called Cumberland. 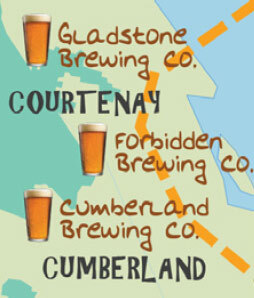 In the middle of that oasis you will find a tiny slice of Paradise named the Cumberland Brewing Company. In order to frame this story, allow me to mention by way of introduction that my wife and I have been engaging in beer travel fairly constantly for the last 17 years or so, mostly around Cascadia. For a long time, the bias in our travel was towards Portland, for reasons you might be familiar with, including the vibe you’ll find at a number of small breweries there. We didn’t expect to find that same vibe in a town just outside the Comox Valley. The day we travelled there, we had gone well over our time budget visiting Wolf Brewing and Longwood Brewery in Nanaimo, and we were an hour behind schedule with an hour’s drive ahead of us. The pedal was put completely down to the metal. We arrived in a state of half-panic from navigating the highway at top speed. As we entered the tasting room, we were greeted, even before announcing ourselves, by manager Darren Adam (official title: “Sells the Beer”) and brewer Mike Tymchuk (“Makes the Beer”). I got an immediate understanding of Darren’s outlook and personality when I was greeted, not with a glance at his wristwatch, but with an easy “How ya doin’” in his inimitably smooth, casual style. Darren makes you feel like you’ve landed in Jamaica and everytin’ is all right now, mon. He exemplifies what they mean when they talk about “Island Time” in a BC context; I can assure you that any person of Caribbean extraction would envy Adam’s laid-back demeanor. Don’t be fooled by it; he is no slowpoke when it comes to running a business. Mike’s beer credentials are much more straightforward. A brewer since the 1980s, he is the man who started and grew Alberta’s Wild Rose Brewing—you’ve heard of it, and you’d recognize their signature oval labels—into a well-known regional brewery. His raspberry beer sold in vast quantities. His brewing industry experience, before and after Wild Rose, is significant. However, after decades in the business, he needed to decompress before he would even consider getting involved in another brewery. That cooling-off period involved landing in Cumberland and working in wife Caroline’s business, Riders Pizza. That’s where Darren and Mike met; for Adam, who had come in only for dinner, it was love even before first bite. Impressed with Tymchuk’s personable service, he struck up a conversation through which he discovered the breadth of Mike’s brewing ability. Leaving the restaurant that evening, he told Michelle, “I’m going to open a brewery with that guy”. After months of Darren’s insistent prodding, Mike finally gave in and Cumberland Brewing was born, with Caroline (“Counts the Beer”) involved on the administrative end. The operation they set up is small, but first class. With great planning and some ingenuity, Darren and Mike have made their space work, going vertical when no more room was available horizontally. The tasting room was busy the entire time we were there, with people coming for growler fills as well as stopping to have a pint or two. Their extensive, covered outdoor patio was well-used even in the middle of March. Many patrons, arriving on two wheels, used the bicycle rack; those with dogs pulled up and availed themselves of the Pooch Parking. There was no shortage of strollers coming and going. Darren, like other locals, refers to Cumberland as “the Village”. That happens to be the incorporated municipality’s technical designation, but it’s also a perfect label. Not due to the size; due to the character. Folks that have spent time in similar remote enclaves will understand the connotation: think of “Whistler Village”, circa two or three generations ago. It’s a little place where people know each other and treat each other humanely. The culture around the taproom reflects that. Up in the rafters, a nice growler trade-in collection rings the room. More impressive is their Beer It Forward program, started when somebody left payment behind on behalf of another patron’s future visit. Now, dozens of entries fill the small chalkboard on a post at the bar, each one representing a credit toward somebody’s next beer, donated by a friend or stranger. At the time of our visit, there were 7 beers on tap, including their most popular beer, Forest Fog (an excellent unfiltered wheat ale, whose name, upon reflection, is no doubt a tribute to a certain similar Wild Rose beer). Substantial snacks, such as soups, salads, veggie tacos and lamb meatballs are available from their kitchen. Riders Pizza, themed around cyclist culture, pours their beers right across the street. Enjoy a slice of their pie, served on a stand rimmed by a real bicycle tire. “You’ve gotta come here to get our beer,” Darren told the Comox Valley Echo, explaining their decision to forego packaging their product in order to better focus on operating a thriving local concern. “This is the beautiful thing about our model…Change is going to be the only constant.” It’s clear that the two couples involved understand the wisdom of avoiding growth just to meet constant rising demand. No doubt Tymchuk’s experiences would preclude going down that road again. Adam likes to say that CBC is the “Brassneck of the Island”, invoking the “come to us” approach that has become so successful in recent years for certain breweries. Writing this really brought home how much we appreciated our short time meeting these people and visiting this spot. Cumberland was a great place to visit. It must be an even better place to live. 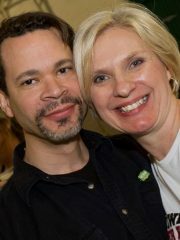 Beer Seekers Dave and Ivana Smith have been touring for craft beer since 1999. Join Ivana and Dave in search of the next perfect pint in BC and around Cascadia.